This is our first official Christmas letter since we were still finishing up wedding thank-yous at this time last year. It’s been a busy and wonderful year! One of my dear friends from college got married in MN in January, and we got to go to a Vikings playoff game with Kirk & Sarah (Joel’s sister) courtesy of Joel’s work. In March we visited another of my former college roommates and her family in MN before we ventured to Beulah to help with flood preparations over Joel’s birthday weekend. Fortunately, all the sand bags we filled weren’t needed! We took another trip to MN for our niece Avanelle’s baptism. In May, Joel celebrated 10 years of employment at Bulldog Media Group (formerly Credit Soup) where he’s the Web Production Manager. He was recognized at the annual company golf outing, given a framed certificate and a jacket embroidered with the company logo. After 10 years Joel is still excited to go to work every day. 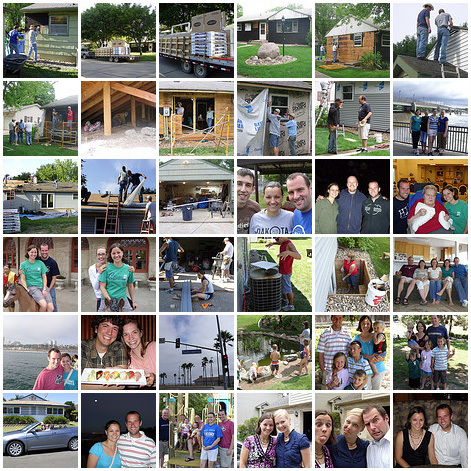 Our summer was filled with house projects. We decided to replace our windows, exterior doors, and shingles, and add a sliding glass door and deck. My dad hauled an 11,000-pound trailer from ND with all our building materials, and we recruited family and friends to help us tackle it all. The projects took longer than anticipated (don’t they always? ), but as of mid-November, we are living in a house with gray vinyl-siding, beautiful doors, new shingles, and a 10 x 16' deck! We can’t express how thankful we are for all who helped. We couldn’t have done it without you! In the midst of all the projects, we were delighted to be able to do a little traveling. I enjoyed a girls’ weekend in the Twin Cities with college friends, and the 4th of July brought us back to ND. We also took a vacation to California where we visited Lazicki and Heringer relatives in Pasadena and Joel’s brother Dave and his family in San Diego. We had a blast! The convertible we rented sure made driving around SoCal a lot more fun. We enjoyed SeaWorld, the San Diego Zoo, the Santa Monica Pier, downtown L.A., fresh-squeezed orange juice, Griffith Park Observatory, Old Pasadena, and playing with our nephews and niece. We enjoyed time at family camp in MN with Joel’s family before celebrating our 1st anniversary in the Twin Cities. We feasted at a fondue restaurant, went to a musical, and toured the new Twins stadium. Our church, West Center Baptist, celebrated its 125th anniversary this year, so we rejoiced in all that God has done. What special times and wonderful memories! We spent Labor Day weekend at LifeLight music festival and also welcomed our new kitten Ibu (“Ee-boo” – the Indonesian word for “Mrs.”) to our house. She’s energetic but we like having her around. We had a little water in our basement when we had record rainfalls this fall, but no major damage…Just lots to clean up. In September I was finally awarded my Certificate of Clinical Competence in Speech-Language Pathology (CCC-SLP), which makes me official! I’m still working for a rehab therapy company doing speech therapy for nursing homes in the area. My mom had her annual check-up at Mayo in October, and the results showed that the cancer protein is starting to come back. We’d appreciate your prayers for her as she will have more tests after Christmas. I was also able to judge an oral interp meet! I’ve wanted to judge ever since I graduated high school, and I finally got to do it! It’s different being on the other side. When we weren’t working on the house or traveling, we kept busy with work, church activities, date nights, and getting together with friends. Joel and I are both on the Missions Team at church, and he serves on the Leadership Council. I’m part of a prayer quilt group that meets twice a month, and Joel is still leading a small group (“power cell”) of high school boys in our youth group. We both help with the Sunday morning services once a month by doing sound and multimedia. We’ve had friends over for meals and game nights often, but not as much as we’d like. At this time of year, we’re reminded of all with which God has blessed us, including sending His Son Jesus to this earth as a baby so He could take the punishment for all our sins, by His grace adopt us into His holy family and give us new & eternal life with Him. Immanuel means “God with us.” That is, indeed, the best Christmas gift of all. God’s blessings to your family this Christmas season and into the New Year!